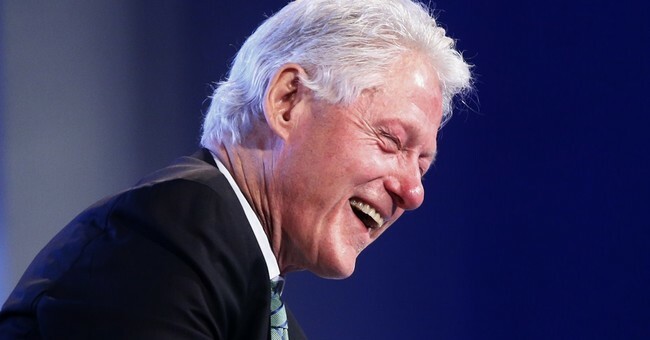 Over seven frenetic days, Bill Clinton addressed corporate executives in Switzerland and Denmark, an investors’ group in Sweden and a cluster of business and political leaders in Austria. The former president wrapped up his European trip in the triumphant Spanish Hall at Prague Castle, where he shared his thoughts on energy to a Czech business summit. His pay: $1.4 million. That lucrative week in May 2012 offers a glimpse into the way Clinton has leveraged his global popularity into a personal fortune. Starting just two weeks after exiting the Oval Office, Clinton has delivered hundreds of paid speeches, lifting a family that was “dead broke,” as wife Hillary Rodham Clinton phrased it earlier this month, to a point of such extraordinary wealth that it is now seen as a potential political liability if she runs for president in 2016...Bill Clinton has been paid $104.9 million for 542 speeches around the world between January 2001, when he left the White House, and January 2013, when Hillary stepped down as secretary of state, according to a Washington Post review of the family’s federal financial disclosures. Although slightly more than half of his appearances were in the United States, the majority of his speaking income, $56.3 million, came from foreign speeches, many of them in China, Japan, Canada and the United Kingdom, the Post review found. The financial industry has been Clinton’s most frequent sponsor. The Post review showed that Wall Street banks and other financial services firms have hired Clinton for at least 102 appearances and paid him a total of $19.6 million. "I think there's a distinction between, you know, being wealthy and having sort of this sense of good, [versus] being wealthy, and just wanting more, and more, and more, and more, and more. And if you look at all of the polling and the data, that's why people hate Wall Street so much. Because Wall Street is that 'we're wealthy, and we want more, and we'll do anything to get it.'" The Clintons' wealth accumulation is virtuous because of their inherent "sense of good," or something, whereas Wall Street cash is dirty and fueled by unbridled greed. Good to know. I'll simply point out that the top source of Bill Clinton's speaking fees was...the financial industry, according to the Post. He was delighted to take their filthy money. (2) "The Clintons have no problem with paying more in taxes." Yes, that's what they say, isn't it? But that's not how they actually operate when handling their own fortune. Bloomberg News reported last week that the Clintons employ elite financial planning strategies designed to shield as much of their estate from federal death taxes -- which they support raising on other people. In 2012, some Democrats actually complained that Mitt Romney overpaid his taxes to boost his effective tax rate higher it could have been, while blithely disregarding his prodigious charity. (3) Mitt Romney was "born with a silver spoon in his mouth." Yes, Mitt Romney grew up in privilege. But his father did not. George Romney was born in Mexico, moved to America and became a self-made millionaire, and was eventually elected governor of Michigan. At what point did his first-generation wealth magically morph into a talking point with which to diminish the accomplishments of his children? Who is the arbiter of what constitutes fairly-earned vs. ill-gotten affluence? Fowler says the Clintons are a "great example of the American dream," but insinuates that Romney is not. How do these rules work? Does Romney get any credit for giving away the inheritance he received? Fowler applauds the Clintons for the philanthropic efforts undertaken their foundation, but doesn't mention Romney's supreme generosity. Ah. Perhaps it's ideological liberalism itself that confers this nebulous "sense of good" upon right-thinking recipients. One could make the case that Mitt Romney amassed his fortune through exceptional business acumen -- turning around failing companies while helping to create and save thousands of jobs. The Clintons' money mountain was built by traveling around and reciting paid speeches (partially or primarily written by aides), and signing mega-deals for (at least partially ghostwritten) books. There's nothing wrong with either of those things, but as Chuck Todd says, "they didn’t [make their money] in some incredible business creating jobs and all of this. They just acquired wealth for being the Clintons."